When any party to a contract, whether oral or written, fails to perform any of the contract’s terms, they may be found in breach of contract. While there are many ways to breach a contract, common failures include failure to deliver goods or services, failure to fully complete the job, failure to pay on time, or providing inferior goods or services. In other words, a breach of contract is a broken promise to do or provide something. To explore this concept, consider the following breach of contract definition. An unjustifiable failure to perform terms of a contract. Among the most common causes for lawsuits in the U.S., breach of contract occurs in many ways. The law offers a variety of remedies for each such breach, designed to make the injured party whole. Court-ordered remedies for breach of contract cases are not meant to punish the breaching party, but to return the injured party to the position he would be in if the breach had not occurred. A homeowner hires a contractor to put a pond in his backyard, showing the contractor the black liner her would like installed under the sand. The contractor instead installs a blue liner of the same design and thickness, which is totally hidden from view. The contractor may have breached the precise terms of the contract, but the homeowner cannot ask that the contractor be ordered to take out the pond and start over with the black liner. The homeowner could ask that the contractor be ordered to refund the difference in price between the requested black liner and the installed blue liner. In this case, because the color of the liner has no affect on functionality, and the price was basically the same, the difference in value, or “actual damages,” is zero. Failure of one party to perform his obligations under the contract in such a way that the value of the contract is destroyed, exposes that party to liability for breach of contract damages. For example, if the contractor in the above example had used thin plastic not intended for the rigors of maintaining a pond, which could not be expected to last as long as the pond liner, the homeowner might recover the actual cost to correct the material breach, which would include removing the pond and replacing the liner. A material breach of contract may relieve the aggrieved party of his own obligations under the contract, and give him the right to sue for damages. Such a total breakdown of the material provisions of a contract may be referred to as a “fundamental” or “repudiatory” breach. Jane agrees to sell her antique sewing machine to Amanda, and the two agree on the purchase price of $1,000, the sale to occur on May 1st. On April 25th, Amanda tells Jane that she cannot come up with the money on time. Following this communication, Jane can reasonably assume that Amanda is in anticipatory breach. This enables Jane to sell the sewing machine to someone else, or potentially file a lawsuit against Amanda for breach of contract. In certain cases, an aggrieved party may not be made whole through the award of monetary damages. He may instead request the court to order “specific performance” of the terms of the contract. Specific performance may be any court-ordered action, forcing the breaching party to perform or provide exactly what was agreed to in the contract. Specific performance is most often ordered in a contract involving something for which a value is difficult to determine, such as land or an unusual or rare item of personal property. Courts in the United States are virtually inundated with breach of contract cases. Small and large, the decisions in such cases shape the way American’s do business every day. In 2008, the Revelations Perfume and Cosmetics company sued the famous musician “Prince” and his music label, seeking $100,000 in damages for reneging on an agreement to help market their perfumes. The flamboyant pop star had promised to personally promote the company’s new perfume named after his 2006 album “3121,” and to allow his name and likeness to be used in the perfume’s packaging. Prince then refused to grant interviews related to the project, and refused to provide a current photograph for a press release. In its breach of contract complaint, Revelations asked the court to award more than $3 million in lost profits, as well as punitive damages. The judge found no evidence, however, that the pop star acted with malicious intent, and ordered him to pay nearly $4 million for the cosmetics company’s out-of-pocket expenses. Revelations’ request for punitive and loss-of-profits damages was denied. Macy’s department stores filed a breach of contract complaint against Martha Stewart Living Omnimedia for making an agreement with J.C. Penney for the creation of Martha Steward retail stores within their retain stores beginning February 2013. Prior to the deal, J.C. Penney had purchased a minority stake in Steward’s company for $38.5 million. The mini-retail stores were to carry Martha Stewart home goods, however Macy’s argued they had been granted an exclusive right to make and sell certain Martha Steward Living products in an agreement signed in 2006. Macy’s asked the court to grand a preliminary injunction to stop Steward from breaching the contract while the court considered the matter. Twelve years later, in June 2014, a New York judge ruled that J.C. Penney had indeed stepped over Macy’s contract with the domestic diva in its attempt to sell products bearing her name. While the J.C. Penney contract has been nullified, monetary breach of contract damages were not immediately decided, and may be limited to the legal fees and costs of the lawsuit, as the judge decided the case did not warrant punitive damages. Offer – Some discussion and an agreement to the provision of goods or services in exchange for something of value must have been made. There must have been the intention to enter into an agreement or contract. Acceptance – An agreement to the essential terms for the exchange of goods or services for something of value must be entered into. Written contracts make proving such terms easier, as they document specific terms to which the parties have agreed. Consideration – Each party to an oral or written contract must have received something of value. In other words, in a valid contract, each party has something to gain. A promise by one party to provide a good or service without receiving anything in return looks a great deal like a gift, which is not enforceable. Strictly speaking, a breach of contract occurs if any of the terms are broken. Not every term is taken literally, however. To warrant the filing of a lawsuit, a breach of the terms of the contract must actually detract from the value of the contract, being considered a “material breach.” Alternatively, the breach of contract must change the outcome of the agreement in such a fundamental way, that the aggrieved party has the right to terminate the contract (a “fundamental breach”). To be successful in a breach of contract lawsuit, the aggrieved party must prove that they have suffered some type of loss or damages as a result of the breach. Actual damages or loss may be in the form of money lost, time lost, loss of opportunity, or a host of other losses. Generally speaking, the amount of monetary damages a party can recover in a breach of contract case is the amount it would take to make them whole. For instance, the actual monetary value of the goods or services that were to be provided. In a case where a monetary award would not make the aggrieved party whole, an order for specific performance might be made. 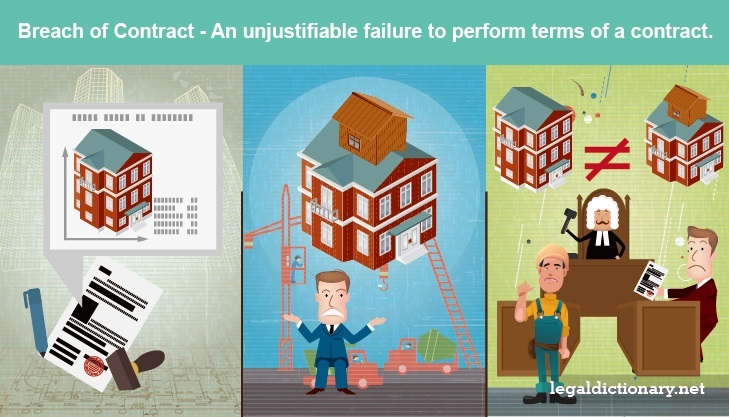 Alternatively, the aggrieved party can ask the judge to cancel or void the contract, restoring them to the position they were in before entering into the contract. In the rare breach of contract lawsuit where the aggrieved party can prove that the breach was an intentional attempt to mislead or defraud, the court may order the breaching party to pay an additional monetary sum as “punitive damages.” In any award of damages for breach of contract, the court is likely to order the breaching party to pay the legal fees and expenses of the aggrieved party. A party to a contract dispute who feels the other party is in breach of the contract, should provide a breach of contract letter to the breaching party that he will be taking action for breach of contract. This is the first, formal step to resolving the issue. Sending a dated breach of contract letter outlining the problem puts the other party on notice they need to do something to comply with their part of the agreement. If it becomes necessary to file a lawsuit, providing a copy of the letter, and all correspondence with the opposing party, to the court helps prove the case. While many people choose to file their breach of contract complaint in Small Claims Court, those involved in high-value contract disputes should consult an attorney experienced in contract cases. Actual Damages – Money awarded to compensate someone for actual monetary or property losses. Also referred to as “compensatory damages,” the amount of money awarded is based on the proven loss, injury, or harm proven by the plaintiff. Specific Performance – An equitable remedy in which the court compels a party to a contract to perform duties agreed to in the contract. Yes it is a breach in the sense that ,there is no consideration and they didnt not disclose all the information to you. You sales man should be hold accountable. I would love to share more advise ,i’m based in China. this is the fault of BFA, the reckless of the conversation that Dr Andrew agreed and signed the consent form under two conditions. The conditions are that Jeremy’s training and games will not disturb his school work and secondly that Jeremy will only play home games. And here: He did not fully read the contract before signing it that he was not aware that the contract also includes away games. In Dr Andrew’s conversation with Mr. Taito before signing the contract, the later reassured that Jeremy will not be playing on tour games. you really can sue to him why not? ” I ordered A+ quality of 1000 cans 3 liter each. however, supplier provided me with 900 cans 2 liter each A quality with 2 weeks delay. and promised to deliver remaining quantity within a 10 days. ” if this is the case, he have the quality of A+ but he do not want to supply (breach of duty to care) and later on he supply it. You should have filled a complaint on breach of a contract by supplier ,they didnt deliver in time but you can avoid in this case since you didnt not give the seller the nachfrist notice. And you didnt avoid the goods due to conformity and you were supposed to taste the good before providing them to your clients. However the CISG want the defendant to invoke remedies other than avoidance like reduction in price and damages as compensation. The is no fundamental breach of a contract in this case.I’m Based in China ,major :International trade. There is no reason that you could sue to him because in the contract it is mention before that due to the financial reasons he can let you go. But, if you have good enough evidence that the proof of his finance you can sue to him. I am a provisional instructor at a tech college. On May 2 I was informed that the school was not going to renew my contract. In our negotiated contract it states that the notice of non-renewal must be given by April 1. Since I received my notice of non-renewal on May 2 does this qualify as a breach of contract? Hi- I had a aibnb guest throw and unauthorized party that caused the house to look a bit rough around the edges. I did the best i could and by all rights the house was clean and ready for the next guests arriving the same day 6 hours later. The new guests complained of the condition and charged back funds from my account. Is guest who held illegal party liable if I am unable to recoup funds due to breach of contract? Do i have a case in small claims? When breach of contract happened only promisee side then what happen if promisee is minor (16age). yes ,how can i help you.